Later there's a Whitehouse press conference on the new American first dog. More controversially, Bo has been away being trained to be a 'little gentleman', rather than being trained in situ by the family. Ideally Bo should be bonding and living with his people, but it is an unusual situation. 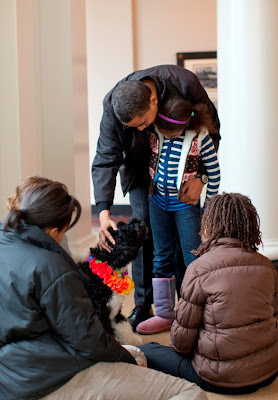 How many proper dog people would sell the Obamas a dog? They'd struggle to get approved to take on a rescue dog from most of our national charities. Kids under 12? Both parents working? Lots of overseas travel.... "sorry, nothing suitable." Little Bo will need some pretty good dog carers around as I suspect establishing anything like a normal routine is going to be pretty tricky otherwise. And about the choice of breed, isn't it a little testing for a first dog? Not just as the Presidential First Dog, just as a breed to be anyone's first dog? While the name of the breed sounds a bit like a gundog the dogs were actually used to herd birds into nets - a little like the Nova Scotia Duck Tollers. So a combo of herding and gundoggy? Sounds a bit like a Border Collie x Springer to me... dynamite on the activity levels if the working instincts are strong. Wonder what shape the Oval office would be in after a bit of doggie DIY? What other negatives are there with what is a numerically very small breed? All the American PWD can trace their roots back to 31 dogs! I do hope the family are going to appoint a good progressive dog advisor. A small gene pool and known autoimmune concerns? I'd be looking at feeding and vaccination regimes carefully as well as stress levels. If MHC erosion is the problem they'll really need to watch those environmental triggers. 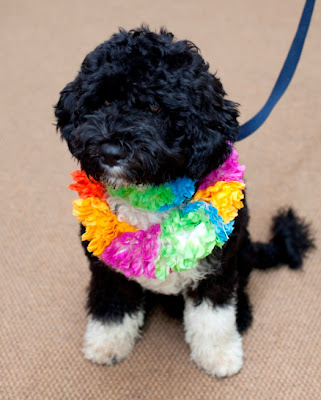 Whatever happens Bo will live a very public life in the Whitehouse... perhaps this little dog will heighten awareness of inbreeding issues? Autoimmune blights my breed and it's ghastly. PWD get Addisions - found in animals and in people - ironically John F. Kennedy also lived with the disease. There's the usual eye, hip and elbow problems together with some more unusual nasties like Puppy Heart Disease, hair loss at two or three years old particularly if two curly dogs are bred together, and the very nasty neurological GM-1 storage disease - but as that's usually fatal by five months, Bo looks to have side-stepped that one. I'm guessing this dog has already had every possible test and the breeder and the line has been closely examined. So with all those months of contemplation, did the Obamas make the right choice? I'm sure they'll love Bo to bits, who wouldn't. We all love the dog we're with despite any health concerns. Why oh why did they not consult with people regarding the message this sends out. Why pretend this dog is a house pet?! I also think it speaks volumes that the poor little pup has already had to go away to be trained. If no one in the household has time to train a dog then I'm sorry they shouldn't have a dog. I think in some ways this is the ideal way to get a dog. First home didn't work out, so the breeder took him back in and worked to find another home. A lot of people chose to send their dogs away for training - I've taught some of the dogs I walk to do certain things (recall, walk on a lead) and while they are definitely better with me as their 'trainer' they are better with their owners than they perhaps would be otherwise, and I do try to pass on the methods that work with their dogs (if I can't do it I recommend a 'proper' trainer). I think it is unlikely the President or First Lady will appear at the local dog training company once a week, so while ideally they would have called in a professional to work in the 'home' environment at least the dog is going to get some basic training and hopefully some socialisation. It's so easy to be judgemental about how other people treat their dogs, and who should and should not be 'allowed' to have one due to work, children, 'wrong' type of dog for the owners or other circumstances, but the dog is a fact so the point should be 'how can we make this work' not 'shouldn't be allowed!'. More people HELPING and less people JUDGING would be of great benefit. Not that I think the President will need help. If he needs a dog walker or dog sitter I don't suppose he'll be fretting over how much the dog is costing him while his family can't be with it. I would like to see the dog's natural instincts find an appropriate outlet. Good luck (lick!) to him, and lets hope he's a shining example of how it's possible to make it work. I do a lot of helping as I am myself a trainer and have lots of people who want me to take their dogs away for training however in my humble opinion it never works as well as it would if the owners themselves would take the time to put the work in. If I come across as being judgemental it's because I also run a dog rescue and I often am the one 'picking up the pieces'. I do home dogs to people who work, have kids etc but I like to home to people who do at least have time to train and bond with their dogs. Teller, have you ever known a dog with an autoimmune disease? To allege that I would wish that upon any dog is something I find deeply distasteful. Your agenda appears the more suspect to me. Mine is to prevent suffering and preserve our beautiful pedigree dogs. Yours appears to be to try to discredit those that bother to strive for reform to protect them. Just been watching the footage on breakfast news of young Bo and he looked so friendly and cuddly. I'm sure he'll be a great friend to the girls. Come on Teller, you lighten up and stop being so growly! Having seen the videos of Bo I think he looks lovely - but if he's been to a professional trainer then it's not a very good advert. He's hopeless on the lead! I hope having two young girls to whom is supposed to be a pet he will actually be a family dog. sorry to be growly, needed sleep. 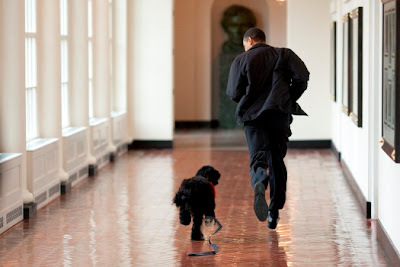 just dont know why the obama getting a dog is such a drama for everyone. Good post Mina - I like your reasoning.